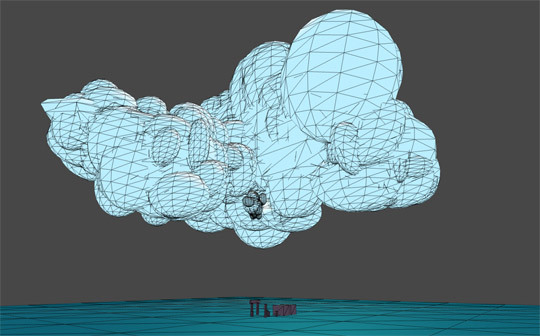 Radiator Blog: Further notes on developing games for virtual reality. Further notes on developing games for virtual reality. I'm pretty sure no one remembers that I promised to release Radiator: Polaris at the end of August 2013 (shhh), but here's what happened -- I was asked to join the Oculus VR Jam, so instead I've spent the last 3 weeks working mainly on Nostrum, a Porco Rosso inspired arcade flight sim / narrative-y roguelike. I think I'm going to work on it for another week or so before going back to Polaris. A lot of my interest stems from VR requiring developers to re-consider a lot of basic ways of doing things in video games. So much of modern game development is about simulating physical presence in a world. So you get a lot of research done on body awareness, screen shake, small camera roll / field of view shifts, and subtle periphery interfaces. But for virtual reality, you can't do ANY of that because it will almost always feel wrong and disorienting. Screen shake feels great on a screen, but terrible in VR. That's a decade of game feel research and convention, now rendered irrelevant, just because you strapped the screen to your head. The main question that's on my mind right now: researchers say games with "fast speeds" can quickly cause disorientation, and so fast games should be avoided. But we have to dissect that observation a bit -- does it mean games where you actually move mathematically quickly, or is it simply the sensation / perception of moving quickly that makes you sick? It's very possible, in 3D worlds, to move quickly through a world without actually feeling like you're moving quickly. A person's perception of speed relies on countless visual and tactile cues. Is it possible to use world art / design to minimize those cues, and thus minimize speed sickness, while still maintaining mathematically fast speeds? So, I thought the flat color aesthetic would help a lot. I deliberately flooded-out most of the environmental speed cues to try to make flying more manageable. Now, your main visual cues are some screen particles and the slow parallax of distant landmasses. Early playtesters for Nostrum, however, have complained that there isn't enough sickness. One playtester specifically requested more surface detail in the ocean so he can feel vertigo, otherwise the feeling of flying isn't really there. This is interesting because so much VR research at the moment is focusing on getting rid of this simulator sickness, yet it seems that many players specifically want the sensation of sickness because then that legitimizes their virtual presence / "feels cool." 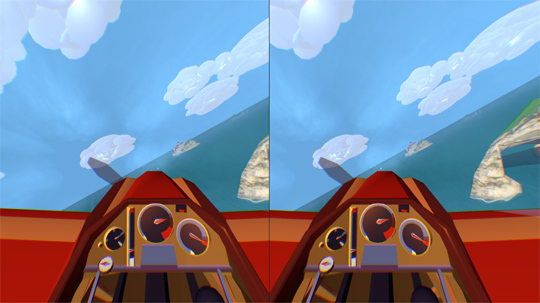 Part of the appeal of VR, then, might lie in the endurance meta-game of "being good at VR." Thus there are political and cultural considerations to designing for virtual reality which will be heavily audience-dependent, and now I have a hard time foreseeing any "middlecore" VR users. I think you'll either want a Tuscan landscape OR a high speed spacefighter sim where you roll all over the place. But maybe there's something in-between? That's the space I'm going to try to carve out.